I’ve just returned home from a trivia night at my son’s school, where my table performed pretty well. I love a good trivia night- it’s the information junkie within me who enjoys the challenge of a random question or two thrown my way. On one round we missed out on full points by half a point because I couldn’t for the life of me remember the name of the band who sang ‘Jump‘, the video featured above. I managed to drag out of the recesses of my brain the lead singer’s name, David Lee Roth, but Van Halen eluded me. It frustrated me no end when Van Halen came to me just as they were about to announce the correct answer! It was loads of fun anyway, just the thing for someone like me who has hoarded tonnes of trivial information away in my brain cells, with their only real function being the perfect fodder for such a thing as a trivia night. Hopefully this weekend will see me get a couple of posts up here. I’ve lost my blogging mojo of late, and really need to get it back. I’ve got plenty to say, but I’m finding the writing process stalling on me, and for the first time ever, I have half finished draft posts awaiting completion. I still feel like I’ve got plenty to say, but I just don’t seem to have the motivation to get fingers to keyboard. I’m going to try and push myself this weekend to get those draft posts published. I’ve returned from a really wonderful holiday in Port Douglas with my family. We had the opportunity to visit the Great Barrier Reef where we snorkeled amongst the coral and fascinating sea life. I didn’t encounter any creatures quite like those featured in the video above, but I did see a truly marvellous array of colourful sea life, all basking in their own private world and probably none too thrilled about the intrusion of human forms into that idyllic space. At this time of year, humpback whales are migrating along the coast of Far North Queensland, and we were hoping we would have the opportunity to see one. On the boat ride out to the reef, I thought I saw a large shape in the water further out, and they stopped the boat trying to spot it. Rather embarrassingly, there was nothing there. On the way back I thought I saw another shape in the water, and once again, other passengers were fixated on the spot, until we were informed by the crew that it was a reef with waves washing over it. Yet another embarrassing moment! After this, I gave up on the whale spotting, figuring there would be no encounters for us. Literally no more than 10 minutes later, the boat pulled up and we were in the midst of a pod of humpbacks who were rising out of the water and giving us all an opportunity to marvel at their size, especially their magnificent tails as they arced down into the depths. At one stage, we were privy to 8 or so dolphins rising in unison through the waves, and then a humpback rose alongside them right next to our boat. My son was lucky enough to capture a really clear sight of the barnacles and scratches on its skin. It was a display of nature at its finest, and it was truly humbling to be there to witness it. There was this feeling of camaraderie amongst those of us viewing these whales; I think there was a collective feeling of exuberance, but also a sense that we were privileged to be in the company of such creatures. It certainly made an already wonderful day even more memorable! Alas, all good things must come to an end, and it’s the end of my school holiday break. I can’t complain, because I am fortunate to teach in a school that gives us a three week break at this time of the year. I feel refreshed and invigorated, ready to meet the demands of term three. I hope you’re ready to meet the demands of your weekend, and truly hope that it brings mirth and merriment for you. Enjoy! I’m in Port Douglas, having a much needed break with my family, so this will be a short and sweet School’s out Friday post. I’m sure you’ll be amazed to hear that I have been offline for much of the last three days, and I’ve loved every minute of it. Life does continue unplugged, and I’m enjoying the less frenetic pace of life where my biggest decision surrounds where we will eat dinner. I have to thank my parents, in-laws, and great friend Helen, who are looking after our much loved animals and ensuring we cam travel knowing they are being cared for. My son has quizzed me every day wanting me to ring to see how they are faring. When you love your animals, travel can be stressful if you think they are not being properly cared for. I know ours are, and am so grateful to the people who help us have that peace of mind. I’m not sure if this video will embed because I’m relying on my iPad to get this post written, so please forgive me if it doesn’t. I’m sure you’ll forgive Noni Hazelhurst too, as she reads Adam Mansbach’s “Go the #%$# to sleep’. If you’re a parent, I think you’ll relate. I’m grateful my kids are past this point! I’ll be enjoying the rest of my stay in Port Douglas, and I’ll be offline for most of it. I hope the weekend ahead is a good one for you. George Couras sent our a tweet this week to this Google Chrome video. It’s the embodiment of what the Web allows; the crowdsourcing of material inspired by someone who has the ability to inspire and motivate people to create content. In this case it’s Lady Gaga, someone who understands that you don’t need record companies to spend millions of dollars promoting your material now. If you’re smart, you engage your audience, you talk to them through channels of social media such as Twitter and Facebook, and you make them feel like they matter to you. Your fans feel like they have a personal connection to you, and they promote your product and make you a superstar in the process. Lady Gaga gets this. So does Justin Beiber, and Will.i.am from the Black Eyed Peas. If you’re an aspiring musician, you better start understanding how social media works, because if you’re going to make it big, you need to find and talk to your audience, and get them to do the promotion that record companies did in the past. How clever of Google to link with Lady Gaga to promote their products. They are a company working very hard right now to crowdsource users to promote Google+, their new social network going up against the monolith that is Facebook. I wrote a post earlier this week talking of how I don’t think I can manage another social network. It took all of two days for me to succumb to the lure of Google+. I still don’t think there is room in my life for another social network, but I have to say there are some things about Google+ that I do like. The circles feature, where you group people into categories, is something I like. You can post content in your stream to specific circles and I like the perceived element of control that appears to come with that. 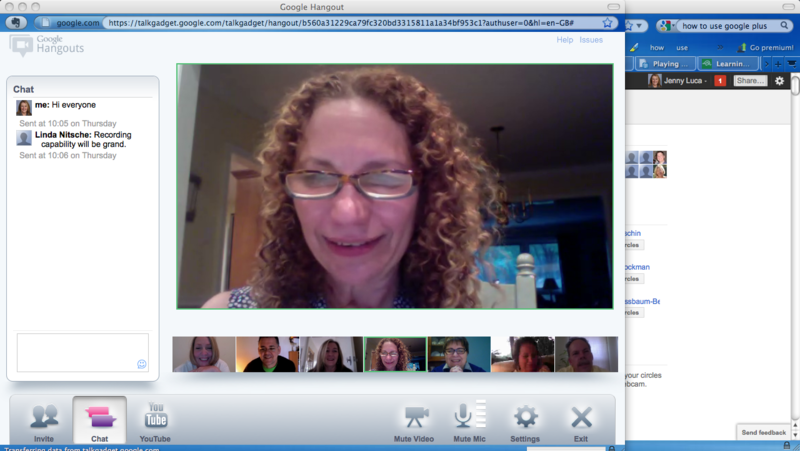 I tried out Google Hangouts with a group including Joyce Valenza, Judy O’Connell, Cathy Jo Nelson, Linda Nitsche, Rob Darrow and Chris Betcher the other morning(see screenshot below). It worked really seamlessly. We could all see and hear one another – there was very little lag and you could conduct a conversation just like you were hanging out with this group in any social setting. No-one had to pick up the microphone like you do in Elluminate; it was a much more natural experience. There are so many possibilities here for education. If you can create circles for specific groups of students, you eliminate the problems that come with sharing content across all of your social groupings. Can you imagine end of year revision before VCE exams taking place in a Google hangout? I can. At the moment, there is no ability to upload a presentation or share a screen, and it’s limited to 10 people. If they work on it though, this presents a real challenge to a company like Blackboard that recently acquired Elluminate. Thank goodness Google released Google+ while we are on school holidays here in Australia. It’s given me a bit of room to play. Next Wednesday, I leave for Port Douglas with my family on a much needed holiday. While I have no doubt I will check into my networks, I intend to do the right thing by my husband and kids and focus on them. There may not even be a School’s out Friday posting next week! Have a great weekend. I’ll try not to play too much with Google+! Our close neighbours from New Zealand have been busy producing some fine resources to help us all teach the fundamental understandings of how Creative Commons licenses work. This terrific little video was made by Creative Commons Aotearoa New Zealand, with support from InternetNZ, and is available under a Creative Commons Attribution 3.0 New Zealand licence. It’s a project of the Royal Society of New Zealand and was produced by Mohawk Media. I’ll definitely be using it with classes to help them understand why we should be thinking about Creative Commons licensing of work we use and produce. It’s a damn sight better than me barking on! Another very handy resource comes from Derek Wenmoth, CORE Education’s Director of eLearning. (You’ll have to visit the link; it won’t embed here) Derek had the opportunity to interview Lawrence Lessig, one of the founders of the Creative Commons organisation. Lawrence explains why educators and students should be thinking about usage rights and mentions how search engines like Google and Bing don’t make it easy to search for Creative Commons material. It’s one of my most vocal criticisms of those search engines too – surely the option to find CC material should be accessible from their front pages, and not hidden in advanced search options. Thanks very much to our friends from New Zealand for providing us with resources we can use in our programs. Have you ever declared something in a public place and then lived to regret you ever said it? I’m sure plenty of you have, so you’ll be able to empathise with me as I declare here and now that I have failed spectacularly at the P2PU course I enrolled in. I think I overestimated my ability to commit time to learning something that is totally new to me and requires so much concentration. I find it hard enough committing time to writing here when I’m working full time and trying to do my best by my workplace and my family. Taking on a whole new set of tasks just kept falling by the wayside. I was also completely overwhelmed by the discussions taking place in the Google site that was set up to support the project. It seems like most of the regular contributors were already Web developers whose skill set far surpassed mine. 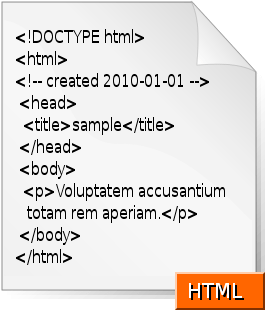 Many were already talking about CSS in the early stages when we were learning basic HTML. I felt intimidated and just kept out of discussions because, quite frankly, I had nothing of value to add. When I did express my failure within the group, Jamie Curle, the course organiser, was very supportive and encouraged me to take things at my own speed. I felt supported, and want to thank Jamie for that. I did learn quite a lot throughout the process, but more about me and how I prefer to learn and less about code! There were no webinars supporting this course, and I felt like a committed time where I had to sit down and devote myself to taking information in would have been helpful for me. Really early on I was struggling with some basic questions I needed answered, but they seemed so lame I didn’t want to ask them in the google site because I was watching threads that were way above my level of understanding. I needed a reference point where terms were explained, but really, I could have sourced this myself. This is probably one of the first times I have been intimidated by course content, and I took the tack of ‘push it to the back of the list of things to do’ rather than meeting it head on. I’ve watched students take this course of action over my many years of teaching, but now I feel like I truly understand why they do so. It’s not a good feeling being out of your depth. This experience will certainly help me to have greater empathy with students encountering difficulties, and hopefully I’ll be more open to varying the ways I deliver instruction. Today Jamie announced that the course is ending before the CSS part begins, because he is having difficulty managing the preparation and follow up needed for the course, along with the demands his own design business. For me, a relief, for others, disappointing. I totally understand where Jamie is coming from. There comes a time when you need to look after yourself and your own mental health. I have over-committed myself in recent years, and this year made a determined effort to pull back a bit. I think it’s made a difference to my interactions with those closest to me and that’s important. Hopefully Jamie will feel that his decision has been a positive one for him personally. So there you have it, public failure I am. But that’s OK. I’ll live on to see another day, and maybe one day the opportunity will arise where I can immerse myself totally in understanding the basics of coding. In the meantime, I’ll keep my eyes peeled for an intensive workshop in some exotic location somewhere warm!